What makes a game great? Is it the graphics? Is it the storytelling? I can’t put my finger on it but as I’m holding the newly-released media kit for The Last Guardian, I haven’t even played the game yet and I’m thinking that this must be it. The package comes suspiciously oversized. Why does a CD need an A4 carrier bag? The answer becomes clearly evident as soon as we pull it out of the sleeve. The package comes wrapped in a black outer case with the cut-out silhouettes of tiny boy reaching out for a creature that’s already familiar in the minds of gamers everywhere. As the ooh’s and aah’s dissipate and we slip the case off, we can’t help but run our hands over the surface of the box underneath. It’s velvety. And it’s textured just like the wings of a bird. A magnetic latch snaps open releasing a pop-out version of the boy and his creature companion hovering over what can only be the game disc below. But the disc itself is wrapped in more magic. It comes bundled with a white feather with the sepia -toned title imprinted on it. Under the feather are heavy-weighted pieces of paper with the game’s concept art on each one. And finally the much-coveted disc underneath with a cork-like structure holding it in place. As the unboxing comes to an end, our videographer sighs heavily. She says, “There’s so much love that’s gone into this. Thank you for letting me be a part of it.” We can’t help but nod in understanding. Okay, so some might say that all this is over the top. 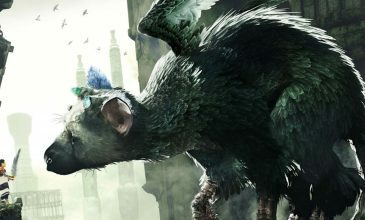 But if you contemplate The Last Guardian‘s journey, it perhaps deserves nothing less. From the first murmurings seven years ago, to its unveiling at E3 last year, the game has had fits and starts, holding the breath of gamers in anticipation. We’ve watched the trailers, seen bits of gameplay and even made guesses as to the fate of the boy and his beloved creature. I daresay there’s a child in all of us that wants to experience that bond that a human can have with a magical beast of their own. Take the time to stop and enjoy the scenery as you follow these unlikely companions on their journey. And you definitely won’t want to miss the ending! The development team and I hope you all have a wonderful time with The Last Guardian. Nothing would make us happier. It’s been a long journey but I’m already feeling like it’s been worth the wait.